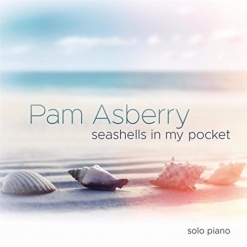 Seashells In My Pocket is the debut album by longtime Georgia piano teacher Pam Asberry. Classically-trained from the age of seven, Asberry always knew she wanted to be a piano teacher and went on to complete a Master’s Degree in Piano Performance and Piano Pedagogy. Like so many of us who had similar training, improvisation and composition were not encouraged, and despite her passionate love for music and the piano, Asberry didn’t feel that she was destined to become a composer. Her quotation explains that feeling so well: “The truth was it felt safer to play someone else’s music than to risk failure trying to create my own. Still, sometimes I wondered, ‘What if?’” Earlier this year, a simple melody came to Asberry when she was out walking one morning, and that melody became her first original piano solo, “Monterey Morning.” By the end of June, she had completed fifteen piano solos, thirteen of which appear on this album. Obviously, the proverbial flood gates have been opened! The thirteen pieces on the album were inspired by some of the islands and coastal cities Asberry has visited. The music is not overly complex, but Asberry has created heartfelt vignettes that describe special times and experiences “like shells plucked from the seashore and tucked into my pocket as souvenirs from a magical day at the beach.” The music is melodic and graceful, and most of it is played at a relaxed and leisurely tempo. It’s an album that easily lends itself to quiet times of reflection or whenever you feel like slowing down the frantic pace of everyday life. Seashells In My Pocket begins with “Cozumel Blue Waters” with its graceful ebb and flow describing the ocean at its calmest and most serene. “Wishing Stones” is light and wistful and was inspired by a tradition in Aruba where stacks of small stones are built on the beach and a wish is made on each stone. While listening to the album, I kept thinking that one of the pieces sounded like a hymn. It turns out that the piece is called “Island Cathedral” and was inspired by the Alto Vista Chapel in Aruba! “Sleepy Tide” is incredibly peaceful and hypnotic - almost magical. “Dunns River Falls” is much more dramatic with a tempo that really moves and some powerful deep bass accents - a favorite. “The Mermaid’s Tears” is a ballad (without words) that was inspired by the legend of the mermaid who tamed the seas to save the life of a sailor and was banished by Neptune to the ocean depths. A very effective piece of musical storytelling, this one is also a favorite. I really like “Ocean Stars,” “a sound painting of the sun shining brightly on the ocean surface, creating glittering stars in the daytime” (quoted from the liner notes). It begins at the upper end of the piano with a lively, dancing rhythm that beautifully imitates sparkles on the water. I love the ending with a simple phrase from “Twinkle, Twinkle Little Star.” “Sailing Home” brings our journey to a close with the mixed feelings that always come as we return to our “normal” lives after an expedition, grand or humble. Pam Asberry is off to a great start with this new phase of her musical career! Seashells In My Pocket is available from www.PamAsberry.com, Amazon, iTunes and CD Baby. Recommended!